If you saw the above photo as an Instagram ad, you’d think it belongs to another trendy online startup selling travel accessories. That’s what I thought after coming across Motile on my phone. Upon further research, however, I learned that Motile is actually an in-house tech and smart travel brand from Walmart that launched in late 2018. In many ways, it’s reminiscent of Target’s own line of attractive tech accessories, Heyday, or perhaps Amazon’s more simple AmazonBasics collection. Solving everyday tech needs like charging and protecting, the accessories are efficient and functional, but also sleek and surprisingly stylish. Importantly, they’re also all really affordable. Motile brings additional utility and style to the category by offering bags and incorporating thoughtful “smart” features into them. Mainly, they get the name “smart” because they feature a built-in (and removable) charger, but they’re also clever in the traditional sense by including a variety of pockets for different needs and taking your active, busy lifestyles into account. Understanding the latest trends in fabric and materials preferences, Motile sells neoprene bags and vegan leather phone cases. Neoprene, the scuba-like rubber that you thought you’d only need for deep sea dives, is equally effective out of the water and perfect for keeping your belongings protected and dry. Meanwhile, leather makes anything look good. High-quality vegan leather looks and feels just like the real thing, but without the high cost or ethical consequences. Motile’s leather is available in a variety of handsome colors including Bone and Camel. The whole Motile collection ranges in price from $7 to $80, but the bulk of accessories will only run you $15 to $30. You can get leather phone cases for a reasonable $15, a Bluetooth speaker for $35, and more. We’ve highlighted some of our favorite affordable picks from Motile below, or you can shop everything from Motile at Walmart here. While on Walmart, you can potentially save more by browsing our Coupons site for a promo code. Motile Neoprene Sport Laptop Backpack, $70-$80, available in 4 colors at WalmartWater-resistant neoprene is the way to go if you want light and functional durability. The backpack contains a 10,000 mAh battery (protected from moisture by a clear window), as well as a padded 15″ laptop compartment and phone pocket. The front zip pocket is even more compartmentalized for your small accessories, with three pen slots, three card slots, and two memory card slots. It comes in four cool color combinations. 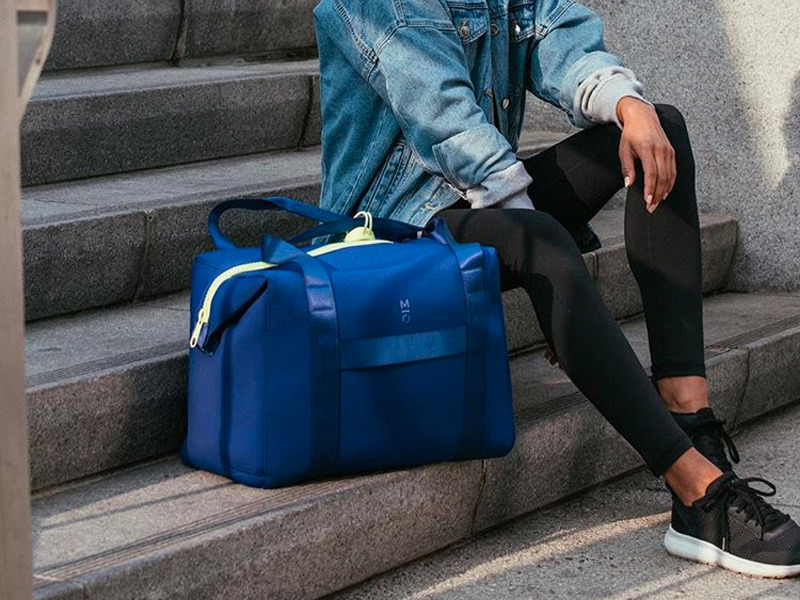 Motile Neoprene Sport Laptop Duffle, $80, available in 2 colors at WalmartWhether you’re traveling to the gym or airport, this duffle, with its multiple pockets and 10,000 mAh battery, keeps all your belongings organized and your devices fully charged. It has a comfortable 10″ handle drop, but if you get tired of carrying it, you can also slide the horizontal luggage strap over your luggage handle. Motile Vegan Leather Commuter Wallet Phone Case, $35-$45, available in 6 colors at WalmartIt’s not always practical or preferable to carry a full purse or backpack, which is where this convenient wallet phone case comes in handy. It features a cash pocket, zip pocket, removable wristlet strap, card slots, and — you guessed it — a 3,000 mAh power bank. This power bank is Qi certified, so all you have to do is place your phone within the pocket to enable instant wireless charging. The exterior of the case is made from a pebbled vegan leather that’s as stylish as it is durable. Motile Wireless Multi-Device Bluetooth Keyboard, $25, available at WalmartTyping on a screen for extended periods of time can get uncomfortable. 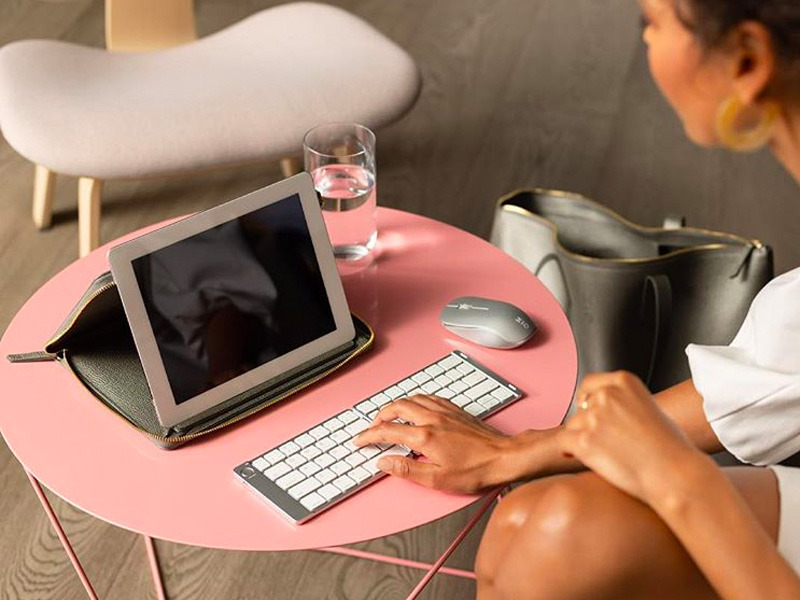 To relieve your fingers, get a Bluetooth wireless keyboard like this one, which folds in half for easy storage and transport. It has the full 65 keys, plus an LED indicator light that tells you when it’s time to recharge. Motile Qi Phone Charging Pad, $30, available at WalmartWireless charging pads are nothing new, but it can be hard to find one that actually looks nice. This fast-charging pad works with any Qi-enabled device and is covered in a textured linen fabric and heather charcoal finish. Motile Vegan Leather Tassel Cord with Lightning Connection, $10-$15, available in 3 colors at WalmartWhat looks like a fun bag accessory is secretly a way to charge your phone. This vegan leather tassel contains a lightning cord for iPhones and iPads and a USB-A port. Available in Camel, Pewter, and Charcoal, it blends in well with the rest of your bag and doesn’t scream “tech accessory.” For something that takes up so little space, keeps your devices charged, and looks stylish, $10 to $15 is a true steal. Motile Combination Power Bank for Apple Devices with Lightning Connection, $40-$45, available at WalmartThis power bank has two parts to it: one part, the 1,000 mAh power bank, breaks away from the dock and lets you charge your phone while you hold or carry it. The other, the 5,000 mAh power base, delivers a full recharge. This design lets you be more flexible and intentional with your charging needs — if you know you’ll only be out for a few hours and just need a quick boost, you can take the smaller one. Motile Portable Bluetooth Wireless Speaker, $35, available at WalmartIf you don’t want to spend more than $50 on a portable speaker, Motile provides the affordable solution. It has an up to eight hour playback time and both Bluetooth and aux modes for extra versatility. The sound may not be the most vibrant and strong you’ve ever heard, but it’s still crisp and clear enough for all your outdoor excursions. You can simultaneously charge your Apple Watch (all models through Series 4) and another device with this slim, minimalist power bank. It features a built-in energy saving circuit that automatically turns it off after 30 seconds without use.